This book is about how to play bridge in a tournament. Unlike club play, the hands are typically prearranged to test your skills. 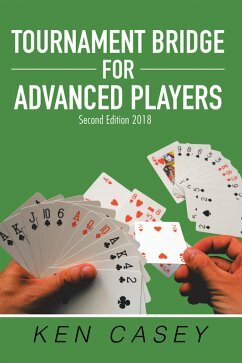 This book gives a comprehensive view of the various types of hands an advanced player might expect to encounter. The various categories of hands presented will teach you when and how to use the end play, when and how to squeeze, how to handle a forcing defense, and how to handle a 41 trump split. The book will also teach you how to play a Notrump hand, such as when to hold up, how to finesse, when to spurn the finesse, when to duck at Notrump, when to avoid the danger hand, how to deceive the opponents, how to unblock, and how to handle transportation. Ken Casey has published 12 books on how to play bridge, how to defend at bridge and how to bid. Ken has also published a book on the national fiscal crisis called The Coming Collapse of America, which maps out a plan to balance the budget. Ken has further published a book on how to insure optimal health in old age called The Casey Diet: Add 10 Years to Your Life. Finally, Ken has published a book detailing the depletion of fossil fuels and describing how the world can seamlessly transition to a world of nuclear power and ammonia fueled vehicles, called The Coming Chaos: Fossil Fuel Depletion and Global Warming. Ken served as a Russian interpreter during the Vietnam War and then spent over 30 years practicing as a tax lawyer. Ken also has an MBA in accounting and a CPA.